Pupils from Cramond Primary School and Arlene Stuart from Forth One were on hand to help re-open the new-look and extended Barnton Scotmid today (26 April 2013), following a complete makeover to improve the store for customers. 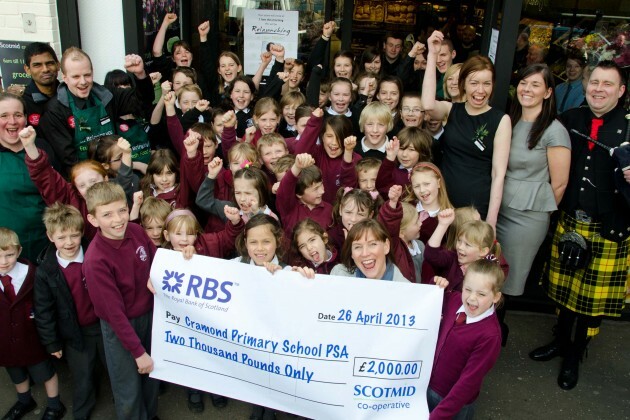 The store’s re-launch was also a chance for Scotmid stores in the area to present Cramond Primary School PSA with a donation for £2,000 to help fund their ‘Our Place’ project, which will see grassy slopes in the school grounds transformed into a large scale interactive adventure landscape for children. The funds have been raised through the sale of two pence carrier bags in Scotmid stores, with 100% of the profit pledged to local charities. Customers to Barnton Scotmid can now enjoy a new in-store bakery, specialty breads, fresh ground coffee, and a freshly squeezed orange juice maker. The store has also been improved by extending the floor space, increasing the range of fresh fruit and vegetables, including a new ‘free from’ product range, adding a bigger and better chilled section, and extending the range of wine and craft beers available. Healthy recipe cards and wine tasting notes for customers are new additions in store, while the store’s fascia and in-store appearance has been transformed to improve the shopping environment for customers.